NB Golf Cars was founded in 1972 by the Ness Brothers (NB) from Hendricks, Minnesota. In 1970, Omer Ness purchased a golf car after he injured his leg. The golf car made it easy for him to navigate around the golf course. Several people inquired about Ness’ golf car and eventually the idea for NB Golf Cars was born. In 1988, Omer's son, Jim Ness, joined forces with his father to carry on the tradition of the Ness family business. NB is one of the oldest Club Car distributors in existence today. 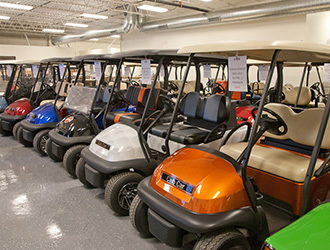 When Omer Ness retired in 2007, the McGowan Capital Group of Sioux Falls put their faith in the NB name and became co-owners of this thriving golf car business. NB Golf has consistently grown in service and sales throughout their 40 years in business. In addition to the original Hendricks, MN. store location, we have added two new stores in Des Moines, Iowa and Sioux Falls, South Dakota. NB Golf Cars has won several awards for sales and customer service distinction from Club Car. Most recently, we were awarded a Distributor of Distinction Award. We proudly added this to our Overall Superior Performance Award (2008) and our Superior After-Market Performance Award (2009). Together, these awards represent our commitment to our customers. We are proud to serve this region and we hope to see you soon in one of our stores.